Ikelite FL 8" Dome Port and Extension Kit for Lenses Up to 2.75"
Extension for Lenses up to 2.75"
Using Ikelite's FL 8" Dome Port and Extension Kit, you'll be able to shoot underwater with your DSLR camera and a wide-angle or zoom lens up to 2.75" long and 3.3" in diameter. The dome reduces distortion and allows your lens to maintain a wide angle of view. This dome and extension are compatible with Ikelite DSLR housings with Four Lock (FL) port mounts, as well as older models with two-lock mounts. For compatibility details, see the FL Port Chart. Optional, interchangeable extensions for other lenses can also be used with the port. 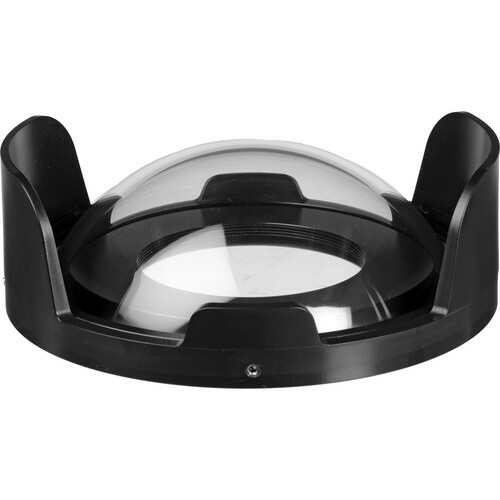 Additionally, the dome can be replaced by the optional Modular Glass Flat Front, which allows for the use of compact macro lenses. Box Dimensions (LxWxH) 10.5 x 10.4 x 5.7"
FL 8" Dome Port and Extension Kit for Lenses Up to 2.75" is rated 3.5 out of 5 by 4. Rated 2 out of 5 by Joel from Good quality I keep all of my camera equiptment stored in a safe case to ensure the protection of it. This item works very well and seems solid but if using it with a small lense such as a 35mm it is hard to assemble. I would recommend using it for a longer lense. I have used it once so far and worked well. Next time I went to use it I opened up the hard case it is kept in and the hood had snapped at a joint in the plastic by itself with no reason to have done that. Not sure if it is just a manufacturing problem with this one item or a common thing with this models. Rated 3 out of 5 by Marty from Can't Use the Ikelite Underwater House Without It The product works great. Just read the instructions and you're good to go. My only frustration and low rating is because I can't understand why B & H wouldn't do a better job of making it clear that body doesn't come with a dome Port and you need one of these in order to use the camera. Also, it only works with macro and wide angle or fish eye lenses. Rated 4 out of 5 by Fish Eye from Great dome, difficult directions worked very well with fish-eye wide angle lens. Directions for the set-up were not very user friendly. Caution: take you time and triple check all the steps as it had you jump all over the place to get it set up right. Removing the shade to have it line up proved extremely difficult. I had to use a rubber mallet which was a bit scary to say the least. It all worked out and the camera stayed dry.